Abtenau is a market town in the Tennengau area of Salzburg. It is situated in the picturesque and reasonably touristy Lammertal Valley, some 45 kilometres south-east of the capital Salzburg. Abtenau is known as a summer and winter travel destination, without drawing too much attention. The town got its market privileges in 1507, when they were awarded by Prince Archbishop Leonard von Keutschach. Since then, Abtenau has been prospering as an economic hub for this region. However, Abtenau′s prime time started only after WWII, when ski lifts were developed and bi-seasonal tourism discovered the Lammertal. Today, Abtenau has a total population of 6,000 - which already demonstrates that there must be more than tourism only that keeps this town going. In terms of sightseeing, Abtenau does not have a great deal to offer. There are a few interesting buildings in the town centre, but no individual ones stand out. Abtenau has a town museum in a former farmhouse; there is a small cultural venue / theatre and a cinema. 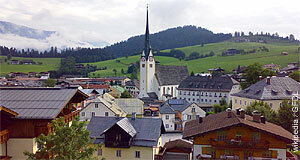 For a town of its size, Abtenau is relatively humble in terms of facilities - which might be due to the relative vicinity to Salzburg. However, international tourists don′t come to Abtenau for finding a vibrant urban centre; just the opposite, the Lammertal region is known for gentle hiking and family friendly skiing. It is the nature and sport delights that make Abtenau attractive for certain kinds of tourists (families, elderly people, locals): The Postalm and the Abtenauer Bergbahnen offer a small skiing area, there is a public swimming pool of quite impressive dimension and hiking opportunities can be found all over the Lammertal. Young people keen on wild skiing and big parties might be disappointed by Abtenau, though. They would probably be happier in the rowdy resorts in the Pongau or Pinzgau area, such as Obertauern or Saalbach-Hinterglemm. That being said, Abtenau′s accessibility makes it very attractive for those that prioritise quick connections from Salzburg.